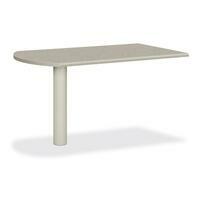 HON 38000 Series Peninsula HON38473G2Q $385.15 Modular steel desking features excellent cable management. Cables can be concealed behind the removable outer side panels of stack on storage units. Wire grommets in end panels allow cable connections between adjacent desks. Stack on units sold separately attach to the work surface through grommets without drilling into work space. Inner walls of stack on storage units have grommets for routing cables. All rectangular components offer steel over honeycomb composite tops. Tops feature radius edges on front and rear edges. Color of pulls match paint selection. Desking features steel ball bearing suspension in all box and file drawers, Tru fit mitered drawer fronts for better visual alignment, one pencil tray per unit except returns, and full extension triple tied cradles on all file drawers for full access to interior contents. Desking meets or exceeds applicable ANSIBIFMA standards.